BeFlexi Dry Bulk Liner is the most cost-effective solution for dry cargo transportation and temporary storage. The liner forms a protective barrier between the product and the container interior, minimizes the risks of product quality loss and prevents cargo contamination. The dry bulk liner forms a dry and contamination free barrier between the product and the container interior ensuring a safe and comfortable environment for transportation and storage of a wide range of food-grade, pharmaceutical, industrial, chemical and mineral products. Food grade products: cereals, grains, beans, seeds, peas, nuts, small fractions (sugar, starch, flour, etc.). Non-food grade products: animal feeds, aluminium powder, colorants, construction materials, detergents, fertilizers, pellets, polymers, solid acids and more. Standard liners are easy to install, fill and discharge and are applicable for a wide range of flowable commodities. Additional equipment is required for solids that are considered by their high angle of repose as hard-to-flow products. BeFlexi offers a varieties of hanging, retention, discharge/loading options including, pneumatic machine, blowing in system, conveyor belt, and gravity loading. We are always ready to help our customers to gain insight into flexitank/liner technology. We provide a technical assessment of your individual needs to select the appropriate products and technologies for a particular cargo. Your staff can receive training on how to install, upload and discharge flexitanks/liners to guarantee a greater load capacity and ensure that the products arrive safely to their destination. We are ready to share our knowledge and expertise and answer all your questions. 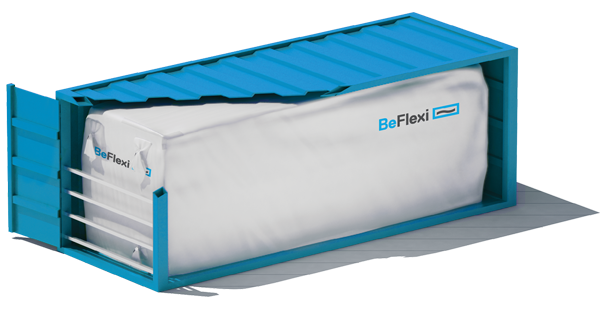 When you consider flexitank/liner technology for your next delivery, BeFlexi is your reliable partner.